January 15 would have been the 89th birthday of Dr. Martin Luther King Jr. 2017 marks the 49th year since his assassination in Memphis, Tennessee, as he supported striking Black sanitation workers who were attempting to win fair pay and better working conditions. In the time after his death, Dr. King has slowly morphed into an unassailable American icon. At the time of his death, however, Dr. King was just as hated in Washington’s elite political circles as he was by Southern segregationists. Washington lawmakers always thought King pushed too fast in attempting to end segregation practices and his public stance against the U.S. war in Vietnam and Southeast Asia (that left more than 5.5 million Vietnamese, Cambodians and Laotians dead) was seen as a betrayal by President Lyndon B. Johnson. By 1968, King’s anti-war stance and his shift to economic inequality led to him being publicly berated by the NAACP, which suggested he stick to civil rights, and vilified by the Johnson administration. Up until his death, the federal government monitored Dr. King’s activities through the J. Edger Hoover-run FBI Counterintelligence Program (COINTELPRO). The FBI attempted to discredit King and even sent him a letter encouraging him to commit suicide right before his acceptance of the Nobel Peace Prize. Once Dr. King was assassinated in 1968, his image was slowly transformed from an outside agitator into the most-respected figure of the past 50 years. Even when Dr. King was alive, he was useful because his principled belief in nonviolent agitation in the face of white mobs and police violence allowed an alternative to more-militant agitators like Malcolm X and later, the Black Panther Party. His death, however, helped create a King frozen in time that could be “publicly” embraced by both political and corporate elites. The King we celebrate today is stuck in a glass case titled “the ‘I Have A Dream’ King of 1963.” The forgotten King of 1967-68 is rarely spoken of in today’s remembrance ceremonies. 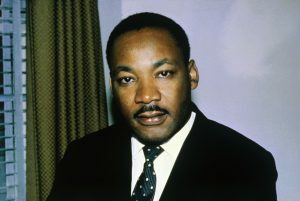 The Dr. King who talked more explicitly about war abroad draining resources from home and about the redistribution of wealth as the next phase of the civil rights movement, and who began to embrace aspects of the Black Power movement on redefining culture and power is nowhere to be found. King’s current memorialization through corporate media eyes plays out as a man without intellect or politics, whose sole purpose was integrating into an America that was on the road to inclusion through peaceful moral suasion. This “depoliticizing” of Dr. King from a man challenging systemic racism and unfair wealth accumulation to one only interested in racial harmony serves the interest of both economic and political elites. While alive, King’s organizing and reach made him a threat not only to the hard-line racist status quo, but also to economic elites within the United States, who did not like the direction of his message. The wealthy don’t appreciate being challenged on their pay to workers, their economy built on warfare and the structural racism that keeps them in power. Shifting King’s image to one that advocates for “better race relations” is something that corporations and the politicians that serve them can support. These same entrenched interests opposed then and now Dr. King’s views on increasing the minimum wage, higher taxes for the wealthy and corporations, and reductions in military spending to increase spending in the United Sates on policies the benefit the poor and working class. Once King was assassinated, co-opting his image became important as a check on the radicalization of both Black and white youths, who rejected some of King’s tactics. Pushing a nonviolent King who wished for an end to prejudice gave political and corporate elites a standard bearer that, reluctantly or not, they could support in the most general of terms. The mainstream image makeover is near complete with King’s holiday now being used as a national day of service, a day to clean up neighborhoods, feed the homeless and work across racial lines. In their hands, racial and economic justice and a fierce anti-militarism have lost their centrality to who King was. Dr. King, if with us today, would not be running a soup kitchen. He would be continuing the challenge to American racism and hegemony. Dr. King would be railing against the National Security State. The revelations by whistleblower Eric Snowden on U.S. government spying on private citizens would surely bring back memories of FBI surveillance, infiltration and attempted neutralization of the civil rights, new left and Black power movements. Dr. King would be defending the young Snowden as a “hero” who himself is sacrificing a great deal to inform the public of U.S. tactics that violate both civil rights and civil liberties. Dr. King would rally against the permanent state of war that we find ourselves in. The United States is still by far the leading arms seller in the world and, having shaken off its supposed “Vietnam Syndrome,” is again ready to use its massive military might to make the world bend to its will. Preserving empire has always been expensive and Dr. King at his zenith called the United States “the greatest purveyor of violence in the world.” King, whose final public break with the Johnson administration was his stand against the U.S. war in Vietnam, would no doubt have taken a similar stand against the war in Iraq and Afghanistan and the not-so-secret drone warfare in Yemen, Syria, Somalia, Libya, Afghanistan, Iraq and Pakistan. Dr. King would point out the obvious hypocrisy of so many celebrating his nonviolence stance while saying so little against U.S. violence abroad. Dr. King would have appreciated Barack Obama’s ultimate “Black first” in becoming the President, but they would come out on opposite sides of Obama’s safekeeping of the U.S. empire through drone and special-operations warfare. The success of aspects of the civil rights movement in desegregating public accommodations, increasing voter rights and creating new economic pathways would be encouraging to King, but it would be obvious that oppression is ongoing. The development of the prison industrial complex, police brutality, the ongoing right-wing battle to diminish Black and Brown voting power and the stagnation and loss of Black wealth would push King farther toward fighting for “poor people.” The tepid tactics of middle-of-the-road Democratic elected officials, Black and white, who invoke him for their every action would embarrass King. He would be outraged by the corporate-aligned leaders of the civil rights movement who have participated in shifting Black consciousness from collaborative tactics and strategies toward individual achievement and a “pull-up-the-pants” answer to questions of poverty. By 1968, Dr. King was mixing demands for racial justice with economic justice. He also was questioning the wisdom of an integration strategy, telling Harry Belafonte, “I’ve come to believe we are integrating into a burning house.” Fighting racial discrimination and breaking down overt legal barriers can mean only so much without putting economic justice at the core of such work. King stated in a meeting with the Southern Christian Leadership Council that, “Something is wrong with capitalism as it now stands in the United States. We are not interested in being integrated into this value structure. … A radical redistribution of power must take place.” Do the new King acolytes challenge the very roots of the economic system that has brought great wealth to a few while leaving others in a ditch? While King was beginning to challenge capitalism along with racial discrimination, his modern-day legacy has been hijacked and become a false pagan idol that can be worshiped at the new memorial in Washington D.C., built by state institutions and corporate elite that opposed him and his policies in life.